A close look at July’s employment report shows that even in a sluggish job market, “tepid” comes in different temperatures, and that focusing on just one headline indicator can get in the way of understanding everything that’s going on. The Bureau of Labor Statistics reported that the seasonally adjusted unemployment rate ticked down two-tenths of a percentage point in July, to 7.4%. While some of that was due to actual growth in the number of employed people (+227,000), it also was due to fewer active participants in the labor market (-37,000). Joblessness among blacks and Hispanics continues to be well above that of whites, and remains higher for all racial groups than before the Great Recession. However, unemployment is falling faster among blacks than among whites: The jobless rate among blacks fell nine-tenths of a percentage point last month, as 228,000 more adults found work. 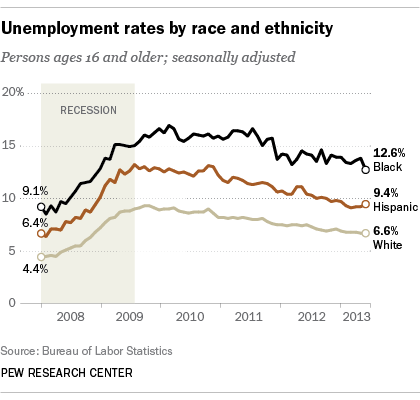 Since black unemployment peaked at 16.8% in March 2010, it’s fallen 4.2 percentage points, to 12.6%. White unemployment peaked much lower than that of blacks — 9.2% in November 2009 — but has fallen by a lesser amount since then: 2.6 percentage points, to 6.6% last month. The number of employed and unemployed whites fell in July, while the number not counted as being the labor force — due to retirement, going back to school, or simply giving up on looking for work — rose for the second month in a row. The aging of the U.S. white population means that over time, they will make up a smaller share of the total labor force, both in absolute numbers and as a share of the whole. Hispanics, meanwhile, are expected to account for three-quarters of this decade’s growth in the nation’s labor force, according to a Pew Research Center analysis. That growth was in evidence last month, as employment among Hispanics grew by 74,000 and unemployment grew by 99,000, while the number of Hispanics not in the labor force fell by 94,000. The employment-to-population ratio, which tracks how many people have jobs as a percentage of the total civilian working-age population, helps fill in the nation’s jobs picture. For the overall population, that ratio has been practically flat for most of the past four years, hovering between 58% and 59% — indicating that, overall, the economy is creating just about enough new jobs to keep pace with population growth. But among racial and ethnic groups, the flattest employment-to-population ratio has been among whites — fluctuating between 59% and 60% since late 2009. Over time, the ratio is expected to fall, as more whites retire than enter the labor force. 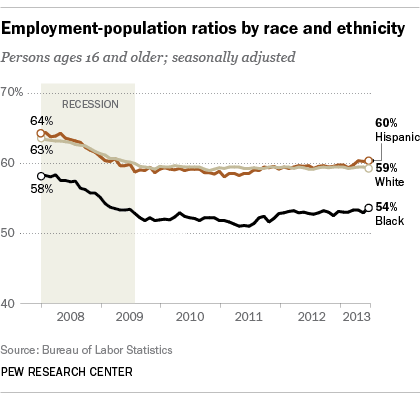 The employment-to-population ratio for blacks, after bottoming out at 51.1% in mid-2011, has lately been moving higher, reaching 53.7% in July. And among Hispanics, the ratio (which closely tracked that of whites for a year and a half) spiked a few months ago; it now stands at 60.4%, a full percentage point higher than whites. All told, the numbers suggest a bit more jobs momentum for blacks and Hispanics.